Samson's flagship Q8x Professional Dynamic Vocal Microphone provides the ultimate in sound reproduction for live and studio vocal and instrument performances. This high output mic faithfully captures a wide dynamic range with exceptional mid-range clarity. Its supercardioid pickup pattern provides maximum gain before feedback, while an updated body design and pneumatic capsule shockmount minimize handling noise. The Q8x's superior reproduction stems from the linear frequency response of its neodymium dynamic mic element. The response is flat with a slight lift around 8kHz. This makes fitting vocals in live mixes extremely easy with minimal EQ adjustments. The mic also features a supercardioid pickup pattern with excellent off-axis rejection. 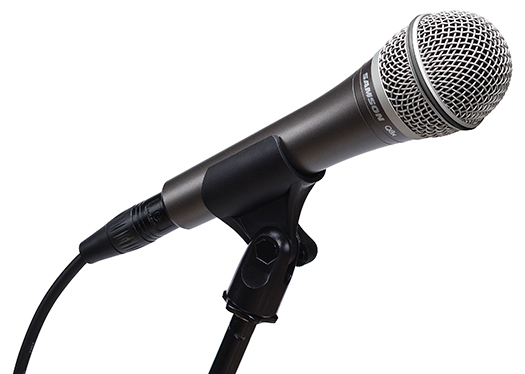 This enables the Q8x to pick up all the nuances of any performance with maximum volume and clarity, while reducing feedback and unwanted signals not originating in front of the mic. In addition, a high saturation level audio transformer further rejects hum and noise.